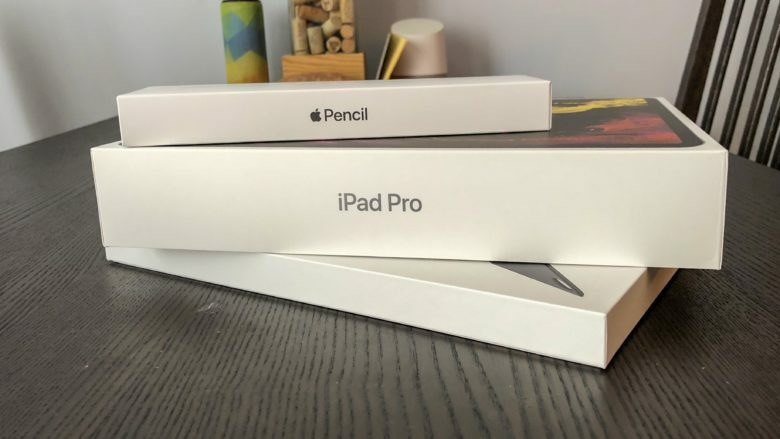 The new iPad Pro, Smart Keyboard Folio, and 2nd Generation Apple Pencil are finally here! It’s finally here – Apple’s most drastic change to iPad since it was introduced in 2010. The brand new iPad Pro with slimmer bezels, a gesture-based UI, blazing fast processors, and a downright gorgeous design. It’s the first Apple product in a long time that I’m truly excited to get my hands on. I picked up the 12.9” model in space gray, with the 64GB storage option, since I’ve personally never found that I need an abundance of local storage on the iPad, with most files being stored in the cloud. I also opted for the wifi-only model since I can always count on personal hotspot from my iPhone if I need data on the go. Inside the box is the iPad itself, which we’ll get to in a moment. Under that, all the typical paperwork that comes with an iOS device: quick start guide, warranty info, Apple stickers, etc. Under that, we have the new 18W USB-C charging block – a VERY welcome change for the iPad. Next to that, a USB-C to USB-C charging cable. What’s not included is a harder pill to swallow. Gone is the USB-A cable (and wall plug). There are no headphones – though the iPad has never come with headphones in the box. Most depressing is the lack of USB-C to headphone adapter. This just shows that Apple is really going all-in on pushing wireless audio, a la AirPods and Beats. If you want the wired option, Apple does sell a $9 ticket to Dongletown that converts USB-C to a 3.5mm headphone jack. Now, on to the main event – the iPad Pro. When seeing the iPad Pro for the first time, the design is reminiscent of the clean, flat lines of the iPhone 5. There’s also a subtle homage to the first generation iPad with it’s flat sides (although without the humpback that housed its internals). The screen itself is also massive. Even with the 1/2” bezel around the entire device, the screen still feels like it pushes right to the edges. If you want to know all the nitty gritty details about the experience, check out our day one review. Moving on to the input accessories, we’ll start with the 2nd generation Apple Pencil. The Pencil comes packaged just as you’d expect – a very simple box that slides open, with the pencil nested inside. Attaching it to the iPad is done magnetically by snapping it to the side of the device. It’s a very satisfying “snap”, too. Moving on to the Smart Keyboard, we once again have simple packaging. Unlike the iPad or the Pencil, I did find the keyboard box slightly harder to open. It’s not a deal breaker, but it wasn’t quite as smooth as some Apple products. Inside the box is the smart keyboard itself. The Smart Keyboard, much like the pencil, attaches to the iPad magnetically, using some selection of the 102 magnets inside the device. The keyboard itself is “fabric” covered, though it feels like a cheap plastic fabric. They keys themselves feel decent, and have a good balance of travel and clickiness. I’m sure I’ll have more in-depth feelings in the full review. And with that said, that’s everything that comes in the box. We’ll have a full, in-depth review up after a few days of use, but in the mean time, our day-one review is available here. If you have any burning questions about the new hardware, feel free to leave a comment below, or on the YouTube video.